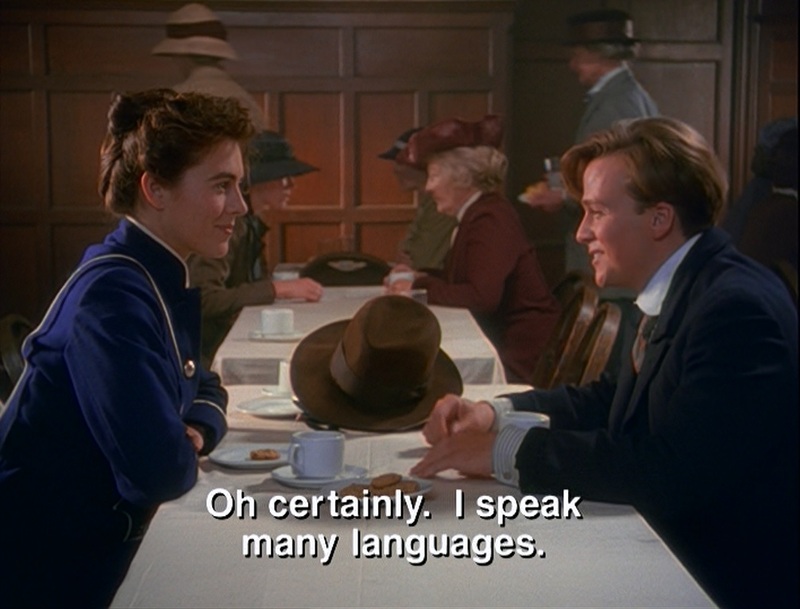 I knew that my wife would enjoy the scene in this episode where Indy and his new girlfriend Vicky try to one-up each other over their bank of languages. She’s conversant in a couple and interested in many others. Maybe it’s stretching credulity just a tad to have two people in London who are fluent in French, German, Italian, Hungarian, Arabic, Greek, and Swedish meeting cute after a suffragettes’ meeting, but it sure is fun to watch. Indiana Jones doesn’t, at this time in his life, know Welsh, it turns out. I also knew that our son would be bored out of his skull by this one. It’s built around Indy and Vicky Prentiss falling in love while waiting for his call-up from the Belgian army, where he and Remy have enlisted. It’s not tremendously exciting, basically. It’s an absolutely terrific character hour, and the producers hit the jackpot in casting Elizabeth Hurley as Vicky, but our son tuned out just like the TV audiences in 1993 did, when this ran as the second episode. Also in the cast this time in small parts are Julian Fellowes, who would later create the popular hit Downton Abbey, and Pauline Melville, who had played Vyvyan’s mum, the shoplifter, on The Young Ones ten years previously. The episode also marks the last chronological appearance of Miss Seymour in what we get to see of Indy’s story. It’s kind of weird how ABC ran these and literally gave us the character’s first appearance in week one and her last appearance in week two, with all the other stories with Younger Indy coming later. 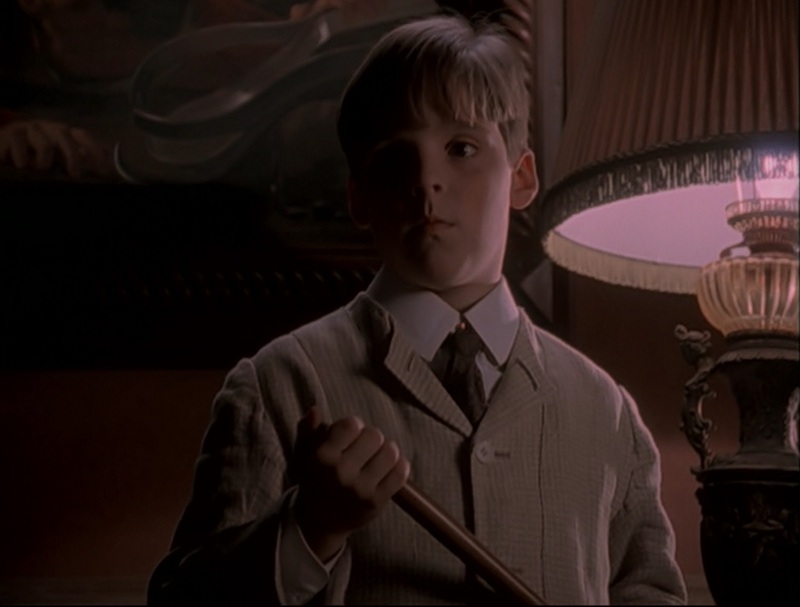 Interestingly, visiting Miss Seymour was actually our son’s favorite part of the episode! Here’s another downside to the way they edited these episodes into the sausage-link movies: we lost Indy’s reunion with Vicky. From what we see here, Indy and Vicky never meet again. But the TV episodes were bookended by the 94 year-old Indiana Jones, played by George Hall, telling his stories to whomever will listen. Admittedly, some of these were pretty amazingly nonessential, as the writers struggled for any tenuous reason to connect an event in the present day with an element of one of the episodes, but the bookends for this story were not. In the bookends for “London, May 1916,” Indy reconnects with a 90-something Vicky, played by Jane Wyatt from the classic sitcom Father Knows Best, who then joins him in two or three of the other bookends. We were meant to understand that Indy’s first great love was with him again at the end of his days, but I think George Lucas later decided that we were never meant to think that Indiana Jones ever had the end of his days. That’s all from Young Indiana Jones for now, but we’ll start looking at the character’s War Years in July. Stay tuned! 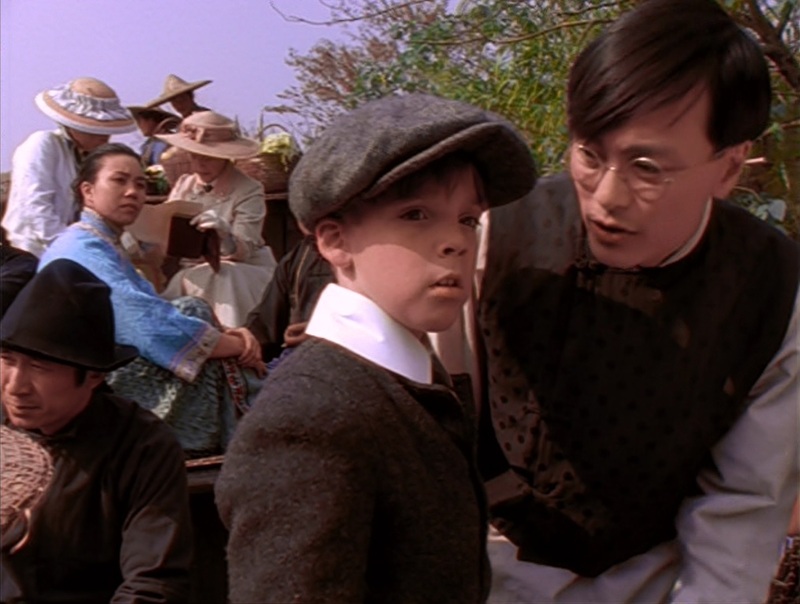 In the chronology, the Peking episode is the last of the ten hours to feature Corey Carrier as Younger Indy, but I think that it might have been the third one produced, and it also might have been planned as the third one with this cast to air. 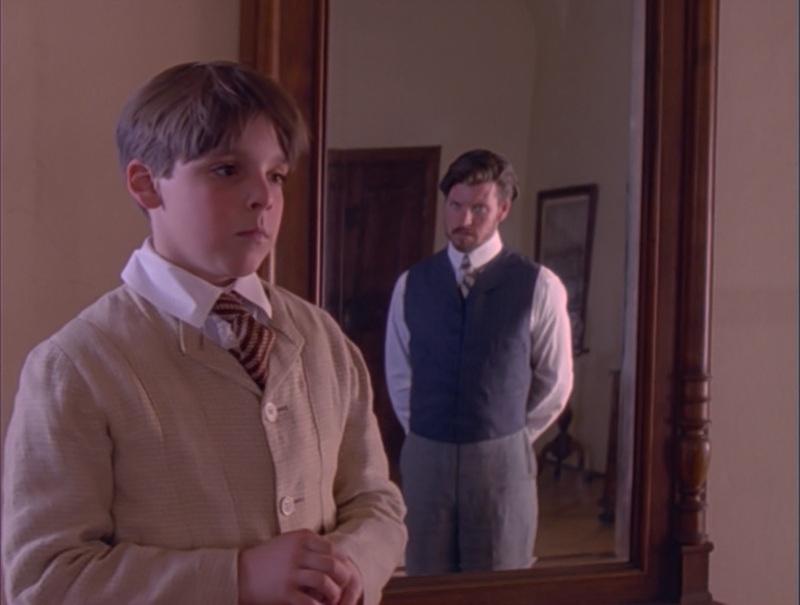 When ABC first gave The Young Indiana Jones Chronicles its six week run in the spring of 1992, they showed the Curse of the Jackal movie (“Egypt, 1908” and “Mexico, 1916”) and five one-hour installments. Merchandising takes a little while to get circulating, and it wasn’t until the summer that we started seeing tie-in material. There were chapter books and coloring books, sticker albums and magazines, and trading cards issued by a company called Pro Set. These were very interesting: the cards told the storyline of the episodes of the first season, except they added the Peking adventure, which was written by Rosemary Anne Sisson, before the show’s closing two-parter. Did ABC originally plan to show six episodes after the movie? We can only speculate, but ever since I saw those cards, I have believed that they intended to show this story on April 1 1992, with the German East Africa/Congo 1916/17 episodes on April 8 and 15. The network got cold feet after the poor critical reception to the first half of Jackal, and quietly moved this one into limbo. It finally aired in June 1993, after the show had been canceled. It’s really too bad that the Younger Indy stories weren’t better received, but they’re still not being very well received in our house today. This isn’t a very talky episode, but it’s more of a drama for grownups. Indy gets incredibly sick while the family is miles from a city, and it will take several days for the nearest American-trained doctor to be brought to the house where they’ve found refuge. The only real drama comes from waiting for Indy’s mother to swallow her pride and agree that a local doctor can treat him with acupuncture. 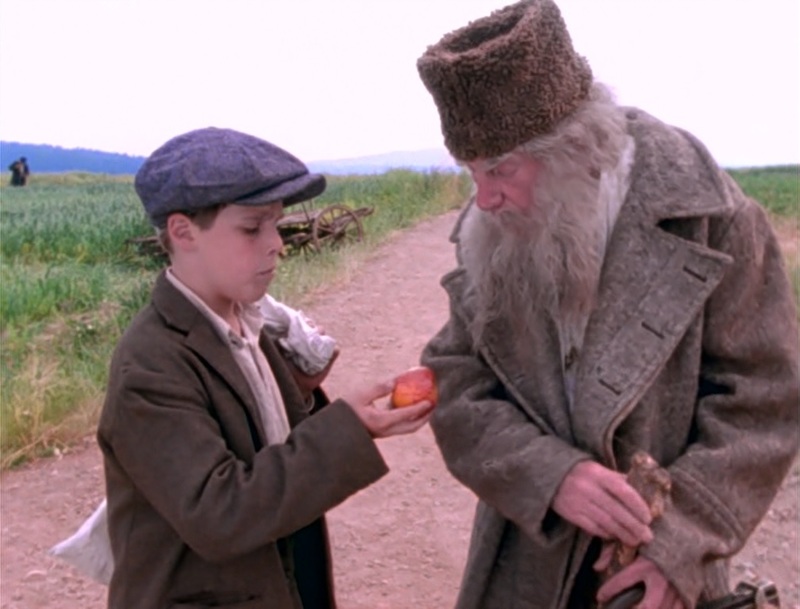 The India episode of Young Indy was among the last ones shown by ABC in the summer of 1993. The program had already been canceled and they were just burning off some of the hours they’d paid for already. 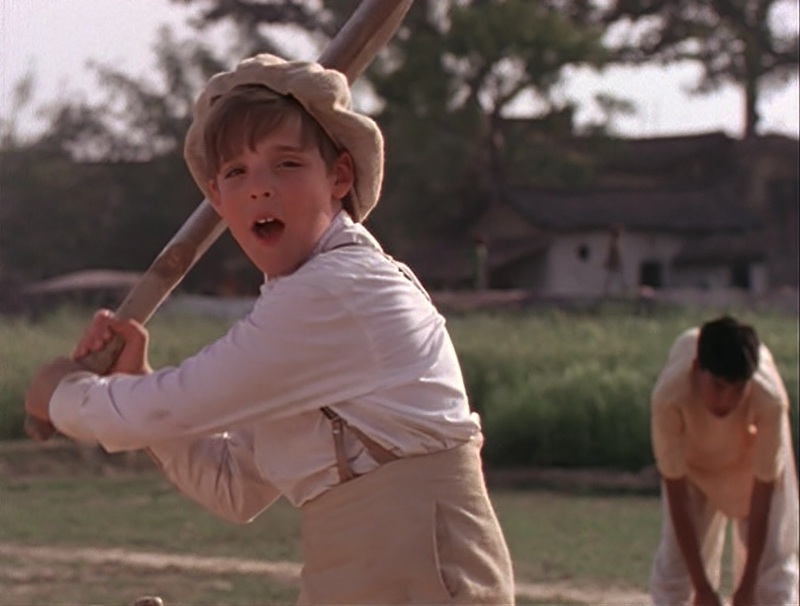 It was written by Jonathan Hensleigh and by far the most interesting part of it was the beginning, where Indy teaches a group of local kids baseball, and they teach him a little about cricket. The show is a gentle introduction to the major world religions, as the city of Benares was once known for being a place where all faiths worshiped with peace and respect from their neighbors. The exception would probably be the Theosophists, and it’s their young figurehead, 14 year-old Jiddu Krishnamurti, who gives Indy the nickel tour while Miss Seymour unsuccessfully tries to convince the Theosophical Society’s president that one of their number is a fraud and a charlatan. I think the show was kind of doomed to failure here. The main characters in this story are all actual people from history, even if they’re ones that have long passed into obscurity. It’s an interesting choice to make Charles Leadbetter the villain, but since Annie Besant never renounced the man, it isn’t going to happen here. Maybe they could have invented somebody else, and a fictional reason for Besant to do the right thing. And maybe they could have spent a little more time playing baseball and cricket. That’s the best part of the hour. 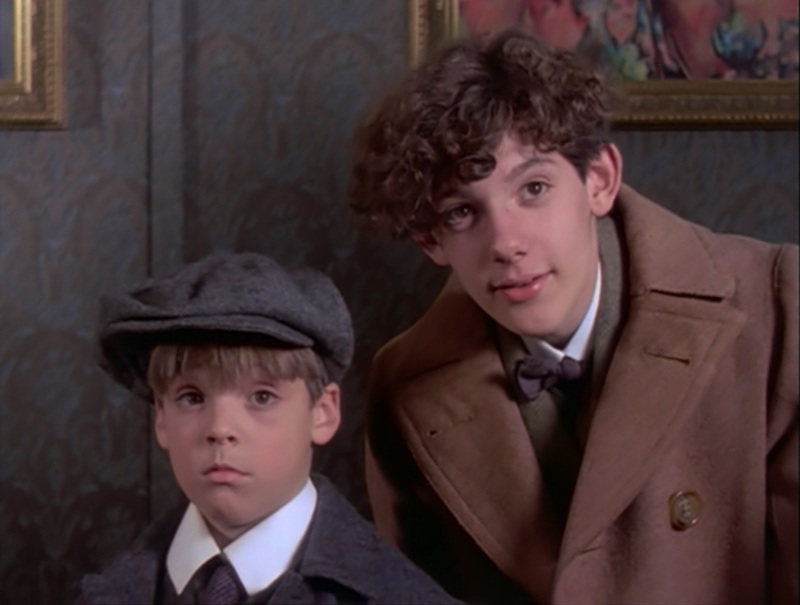 The Vienna installment was one of six episodes of Young Indy shown in the spring of 1993, and the only Corey Carrier one, before the show was taken off the air ahead of the May sweeps period and quietly cancelled. When the show came back with the highly-publicized appearance of Harrison Ford for the bookends of Young Indiana Jones and the Mystery of the Blues that March, it was to a very respectable audience of 18.2 million viewers on a Saturday night. But audiences, whose numbers were inflated anyway by a massive snowstorm that paralyzed the East Coast and kept everyone indoors that night, weren’t going to stick around without Ford. Just four weeks later, this episode, written by Matthew Jacobs, only had 6.9 million watching. Young Indy falls in love a lot during this show, but his first crush is shown in this story, and for a guy with decades of women troubles, he certainly started with a humdinger. He meets Princess Sophie, the daughter of Austria-Hungary’s Archduke Franz Ferdinand, at a riding school while his parents are staying at the American embassy in Vienna. 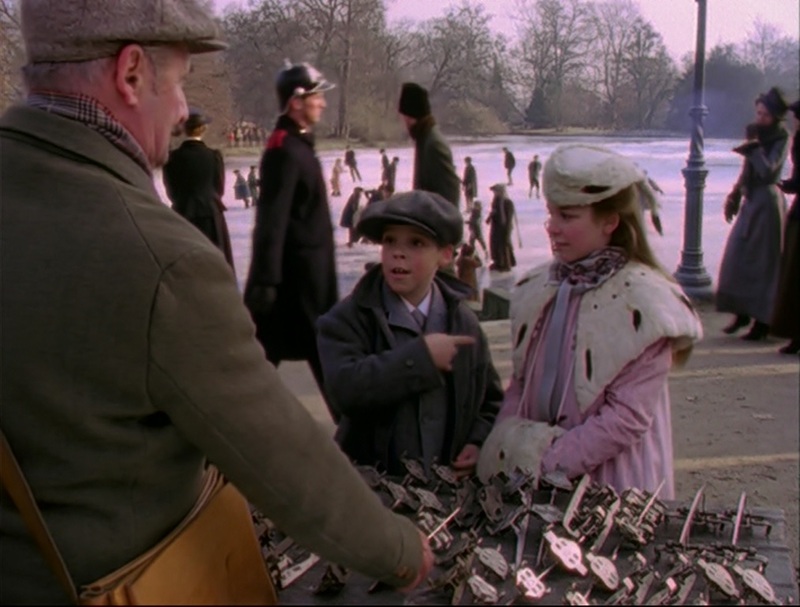 Sophie would have been about seven at the time of their meeting – the real Sophie passed away at the age of 89 about two years before this was filmed – and Indy almost causes a diplomatic incident by sneaking her away to ice skate, having no idea that there were people in Vienna who’d love to see her dead. I had to do a fair amount of walking our son through this one. Everything up to the palace hijinks is very quiet and stately. It looks beautiful – it was helmed by the acclaimed director Bille August, who cast his wife Pernilla in the role of Sophie’s governess – but it’s very talky and hushed. I think he was every bit as confused by the dinner with the psychoanalysts as Indy himself was. Famously, they cast Max von Sydow as Freud. That got a fair amount of publicity in 1993, but it unfortunately didn’t translate to viewers!